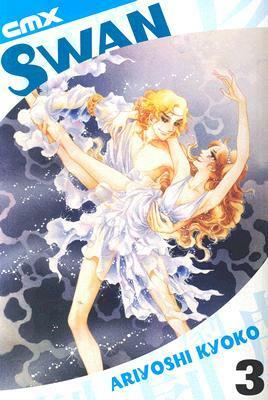 Several volumes into Swan, I think it is a fascinating, but sometimes frustrating manga series. I love the art. Ariyoshi has a fabulous way of showing movement in her drawings, by showing a freeze frame of a dancer at each stage of a leap or jump. I love the detailed backdrops of the dance scenes. I can't decide whether I like Hijiri Masumi, the main character. Most of the time she is the stereotypical Japanese girl - naive, super-sweet, self-sacrificing, modest to the point of being self-destructive. It's a personality type that still features prominently in modern manga series. At other times, however, she displays an admirable amount of inner strength. She's persistent and reacts positively to criticism by working that much harder. She pushes other people to have faith in themselves even if she doesn't treat herself the same way. The plot in volume 3 is framed around Sayoko, the star Japanese ballerina. She performs masterfully in front of a skeptical Russian audience and then sustains a horrific injury. Hijiri is named to take Sayoko's place in auditioning for a prominent role in a Russian ballet. I was pleasantly surprised in the first two volumes that the series was progressing relatively realistically. Hijiri didn't immediately catapult into success. But now, fantasy is setting in. I find it hard to believe that someone who until recently was years behind her peers is now being viewed with respect if not adulation by many skilled professionals. Admittedly, they do acknowledge that Hijiri is technically flawed but I wouldn't think her artistic style could make up for a lack in technique. Still, it's a fun series and I'm eager to continue. As long as her inner strength continues to grow and be present, I think that, balanced with her more stereotypical characteristics, Hijiri sounds like an interesting character. Plus, again. TRAVEL! Always a win for me. I would think ballet is not an artistic medium you could bluster you way through - where style would make up for lack of technique just as you said. It seems to me like technique is of vital importance:) Still, as long as I knew I would have to suspend a little disbelief going in, I'd be fine with it! Sounds like a fun series. Do you think it will turn dark like "Black Swan" or semi-serious yet fun like the movie "Center Stage"? Interesting. Haven't heard about this manga before, and from the way you described it, it seems just okay.